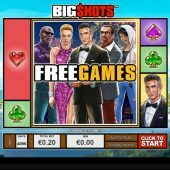 Big Shots slot directly refers to the characters in the game who seems to be resident in a Miami or Saint Tropez kind of seaside community with plenty of wealth on display. This fact is cemented by the sounds of the seaside as you spin along with some funky Magnum PI style TV serial music to urge you along in your quest for wins. 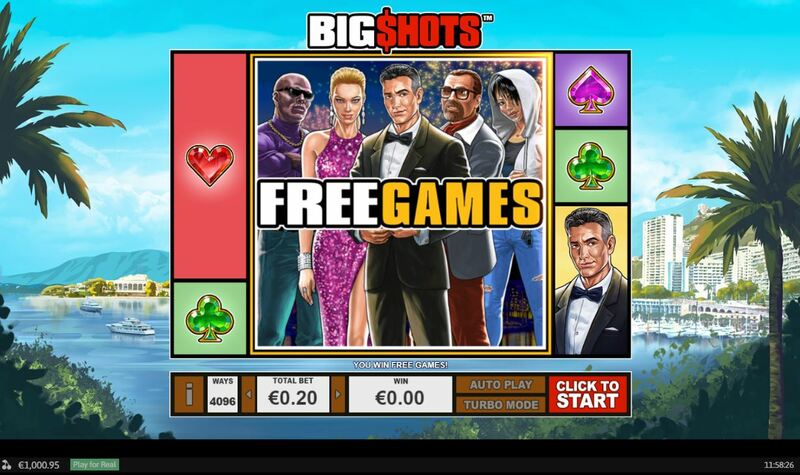 You may think games such as Play'n Go's Pimped, NetEnt's Hotline and Microgaming's Loaded provided the inspiration for Big Shots when you actually play it, but can the slot also deliver a big shot to your bankroll? Well, we do have some big reels on Big Shots as there are 4096-ways to win over 6 reels of 4 rows as you must have on this mechanic. The first thing noticeable is that the symbols are stacked horizontally too as well as vertically and block symbols for example 3x2 can appear. The 6-of-a-kind pays are never huge on 4096-way games for obvious reasons and here we pay 20 coins per play and the Grey Male pays 200, Blonde Girl or Bearded Man 150, Sunglasses Dude or Chinese Girl 100. Four card suits pay 60 down to 20 and Diamond Wilds can appear in stacks or rows of 1 or 2 symbols on all reels and pay 250 coins. You sometimes see a giant 4x4 collage of all 5 characters spinning over the centre 4 reels. This landing fully in view awards 5 free games which can and often do retrigger. If it doesn't land fully in view, don't worry as sometimes it will vibrate and nudge down or up until it does, but not every time! Your enhancement is the fact that all card suits are replaced with the character symbols to increase the pays. The result of these games can be quite good, especially if you get numerous retriggers.